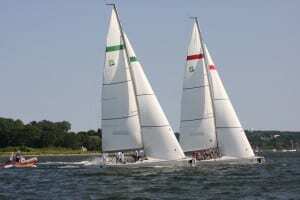 OYSTER BAY, NY (07.13.2014) – Oakcliff’s intensive training program provided a high level of competition this weekend at the U.S. Women’s Match Racing Championship in Oyster Bay, NY. This year, the teams selected for the event were highly ranked through the United States, and several of the competitors are past and current Oakcliff’s trainees including Elizabeth Shaw, Kathryn Shiber, Madeline Gill, and Danielle Gallo. SapGrad Elizabeth Shaw, a member of Stephanie Roble’s winning team (Epic Racing), attributes all of her match racing success to Oakcliff. “Before I came to Oakcliff, I had never participated in a match race. Oakcliff allowed me to find another side of myself through match racing that I had not experienced with other racing before,” said Shaw. Both Shaw and Shiber both participated in Oakcliff’s two signature programs, Acorn (ages 15-18) and Sapling (ages 18 & up). They both believe that Oakcliff has been an incredible opportunity and want to encourage others to join in on the Oakcliff experience. For more information about Oakcliff’s programs, please visit oakcliffsailing.org or contact Samantha Pilz at pr@oakcliffsailing.org. Oakcliff Sailing, Oyster Bay, NY is the only complete training and coaching center in the world. With two signature programs, the Sapling and Acorn, Oakcliff’s goal is to create complete sailors, who are capable of sailing in any position, fixing every aspect of a boat, and managing a small marine business. Oakcliff trains sailors in match and fleet racing, inshore and offshore, fully crewed and short handed as well as providing access to historically significant classic yachts. Oakcliff is a non-profit organization open to all sailors of all ages and levels. Oakcliff has also been named an official US Sailing Team Sperry Topsider Training center with 8 each of the Olympic Classes: Nacra 17, 49er and 49er-fx.